Today we’re talking about the influence Touchscreen Technology has on meeting spaces. We will discuss its increasing use within interactive environments and how it is shaping the way colleagues interact in modern businesses. We will also be detailing some handy solutions designed to support the delivery of interactive touch screen sessions. According to plannar.com when compared to meeting activities using traditional methods touch screens have some major benefits. True collaboration & clearer communication – By working together on a large interactive display teams can collaborate more efficiently using varied resources. Intuitive operation – Faster inputs through intuitive touch gestures that have become a universal language. Efficient Multi-user technology – Solve complex tasks faster and more efficiently with parallel inputs from multiple users. Haptic user interface – Use object recognition technology to extend the scope of your interaction with interfaces that give tactile feedback. Touchscreens and interactive whiteboards are extremely flexible tools that allow multiple users to interact with various types of media. Using interactive screens and whiteboards allows the user to tap into several key innovations that are perfect for use in meeting rooms and collaborative environments. The user may draw over elements in presentations, add notes or labels to images and take notes during brainstorming sessions. Interactive screens are fantastic for active demonstrations. For example, a presenter training a group of colleagues on how to use software, can run the program and interact with it as usual then by touching the board they can use software to highlight and annotate its features. Because they are typically connected to a PC or laptop using applications, browsing the web, playing or recording video and audio and saving work for dispersal to connected users is a simple task. Interactive screens and whiteboards not only facilitate presenter experiences they allow colleagues to interact directly with the content on the board, either alone or with their peers thanks to multipoint touch technology. Users can deliver their own interactive presentations with ease and enjoy more varied meeting formats collaborating using a wide range of media types and interacting more readily with colleagues on projects. Touchscreen Technology is inherently heavy, with larger screens reaching upwards of 120kg. This means that in many cases reinforcement is needed before the device can be safely mounted. This can sometimes mean alterations to existing infrastructure and costly changes to the fabric of your building. Supporting furniture, like Dalen Design Concepts’ Discovery range, is essential whether you are attaching your device to a wall or want a truly mobile solution. Attaching such devices to a wall creates a focal point that users can present in-front of and interact with while a trolley mounted device offers the freedom to position your device wherever it is required. Dalen Design Concepts specialise in technology integrated furniture that facilitates technology enriched practices. If you are interested in creating a more engaging meeting rooms & workspaces that are facilitated the use of Touchscreen Technology, please speak to a member of our team today on +44 (0)121 508 4350, or alternatively, get in touch via enquiries@dalendesigns.co.uk. 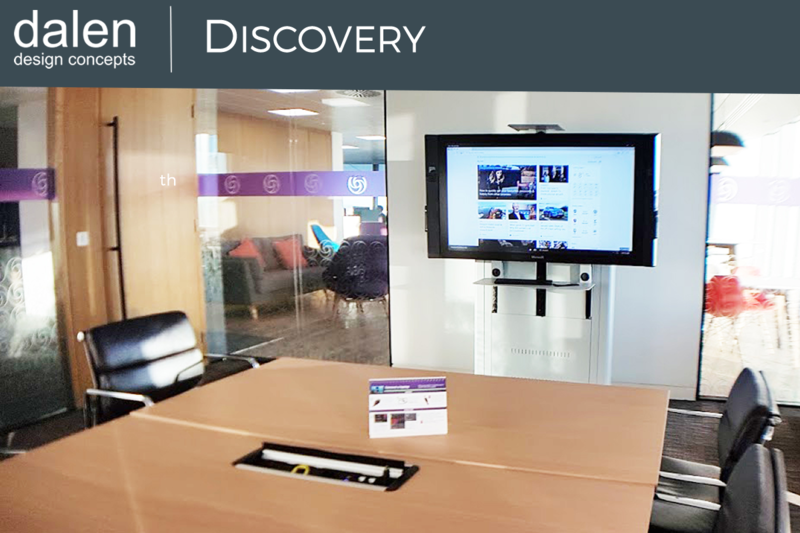 You may also be interested in our previous blog post on Discovery – does your large interactive screen have the right support?